This set contains a full complement of highly detailed replacement aft radar masts (seven in all) with perforated platforms & braces, ladders, ECM huts, and related details for all ships of the class up to CVN-75; a detailed Landing Signal Officer's (LSO) platform with windscreen & safety nets; a full set of custom-fitted open flight deck catwalk gratings with correct grid pattern and built-in locators for fuel hose reels, antennas, etc. plus a full set of pre-shaped braces for their undersides; details for ship's boats (rudders, propellers, steering wheels & windshield), tow tractors (detailed front ends and steering wheels), & boat crane (hooks in two lengths); correct "Tilly" wreck crane boom assembly with rigging; fifty aircraft towbars; pre-shaped Underway Replenishment (UnRep) hose with simulated rigging & pulleys; fold-to-shape stern boat dock for later ships in the class; and two fold-to-shape Naval Sea Sparrow Missile (NSSM) director platforms with deflector bulwarks and braces. Extensive use of relief-etched detailing in 3-D is used throughout this set. Made in .005" thick brass. 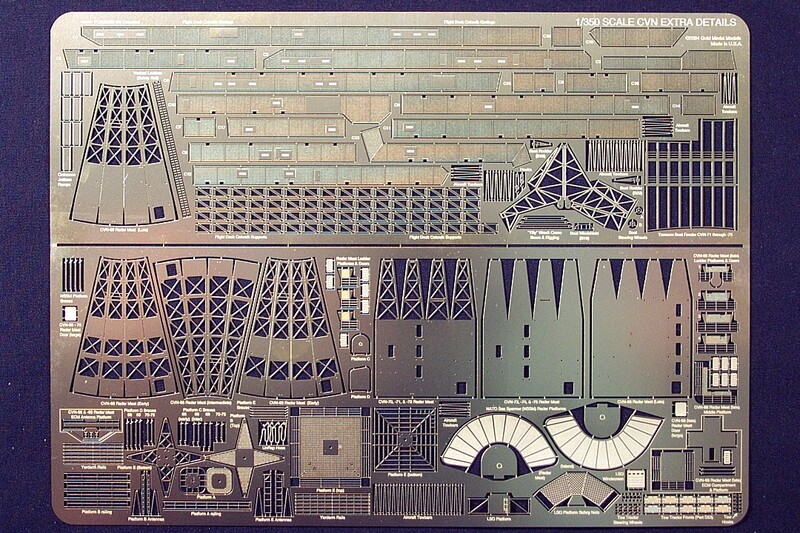 This set is designed to fit Trumpeter's 1/350 scale kit of the USS Nimitz (CVN-68) and to enhance the details in GMM's No. 350-28 (1/350 Nimitz) basic fittings set. It can also be used, along with GMM No. 350-28, to convert the Nimitz kit into other ships of the class. See GMM No. 350-28 for more information. SEE PHOTOS AND REVIEWS OF GMM'S NEW 1/350 SCALE NIMITZ-CLASS PHOTOETCHED DETAIL SETS!